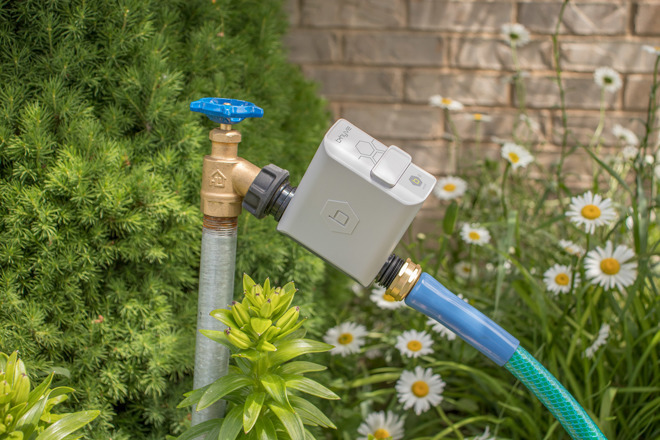 The B-hyve Smart Hose Faucet Timer attaches to an outdoor faucet, fitting on before the hose is attached. For small or basic garden watering needs, the faucet timer provides timer functions that can be configured via an accompanying app. A smart watering schedule can use weather data to automatically alter the watering times, with a fully smart mode creating an EPA WaterSense certified schedule using data including the sprinkler type and the quality of the soil being watered. Multiple B-hyve timers can be daisychained together over Wi-Fi and Bluetooth and connected to a central hub, with the latter able to extend the range of commands if Wi-Fi signal isn't available to out-of-reach timers. The B-hyve Indoor Timer is similar to the original B-hyve Smart Wi-Fi Sprinkler Timer, providing programmable 4-zone and 8-zone control, WaterSense and weather-based automated adjustments, and Wi-Fi and Bluetooth connectivity. Using a simple interface for zone selection and for power, the timer can also act as a hub for the Smart Hose Faucet Timer. The addition of HomeKit compatibility will begin with Orbit's B-hyve Smart Hose Faucet Timer from this month onwards, and will be included in all future Wi-Fi Smart Sprinkler Timers. Once installed, users will be able to control the timers using the Home app on the iPhone, iPad, or Apple Watch, or through vocal commands. Under HomeKit, home owners will have control over basic watering functions offered by the timers, such as manually operating a specific zone, turning off another zone that's already being watered, and switching the timer from automatic to off when the season changes. The Home app can be used to set up automations, allowing different sprinklers to run at specific times, as well as to remotely control them. It is also possible to control the sprinklers vocally via Siri once set up, as well as the ability to query the status of the home's sprinkler timers. It is also possible to ask Siri when the next time the sprinklers will water a zone will be. Previously, the B-hyve range offered smart home functionality via Amazon Alexa. The B-hyve Indoor 4-zone and 8-zone timers will ship in the spring for $59.99 and $7.99 respectively. The B-hyve Smart Hose Faucet Timer and Wi-Fi hub are on sale now in a $69.99 package, with additional B-hyve Timers priced at $39.99.